Happy Monday Friends 🙂 Yesterday, April 2nd, we celebrated National DIY Day by gathering with a group of awesome volunteers to build raised garden beds for a local community garden. If you are unfamiliar with National DIY Day, it is a day founded by Craft Box Girls two years ago as a way to bring people together and celebrate creativity. Last year, people all over the world were celebrating April 2nd, some as far as Australia! As DIY Day Ambassadors we wanted to use our DIY skills for a good cause and so we teamed up with Zaman International, a non-profit humanitarian organization committed to addressing the basic needs and empowerment of marginalized women and children locally and internationally, to host the event. Since their foundation, they have provided essential needs to more than 180,000 clients in Southeast Michigan. In April 2016, Zaman moved into a 40,500 square foot Hope for Humanity Center in Inkster, Michigan. Aside from launching a Food Pantry, Zaman was recently accepted into the Feeding Inkster Community Garden Program which provides seeds, plant starters, garden tools (as available), and technical assistance for the creation and harvesting of a community garden. They are expected to ensure low-income community residents receive harvested, fresh produce in a timely manner. 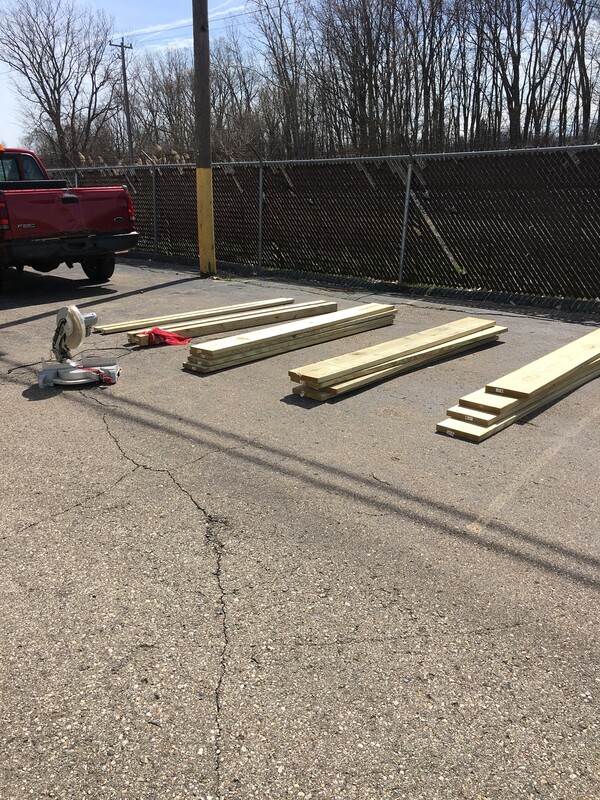 With not much viable land near their warehouse, we stepped in to build and decorate raised beds that will allow them to grow their fruits, vegetables, and herbs. We will be returning early next month to fill the beds up with 2 inches of gravel, soil, and plants but until then we just wanted to share a little bit about our first successful event. There were a few minor hiccups and delays but overall we are very pleased with the end result. With a team of 10 volunteers were able to put together four 4ft x 8ft beds in just a few short hours. 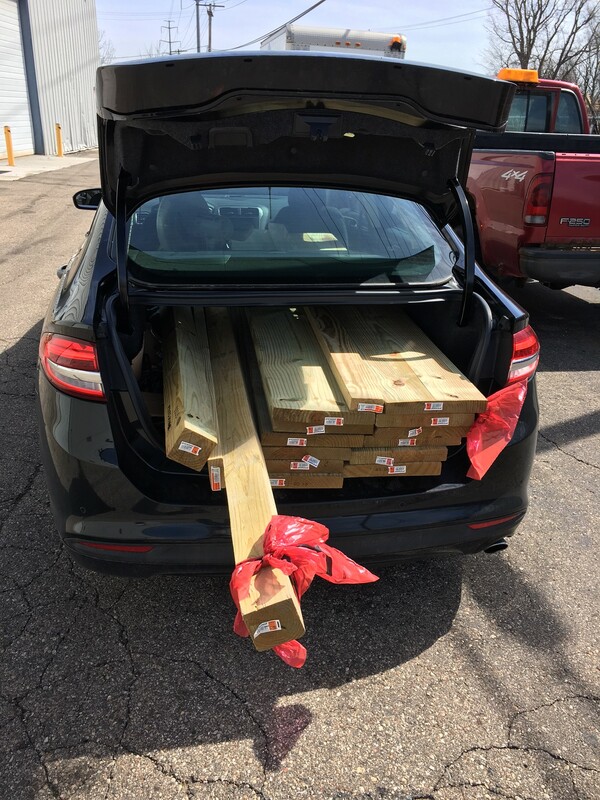 Two local Home Depots were generous enough to provide $25 vouchers to help with the cost of supplies like the screws, paint, and weed-blocker while the Craftbox Girls sponsored the cost of the wood to build the beds. A friend with a background in interior design and art, came up with a few cool designs that were easy to paint and added a fun splash of color to the garden beds. Scroll on down to see pictures from the event and be sure to check back in with us next month when we return to complete the project. If you’re feeling inspired and want to build your own raised bed for your dream summer garden, head on over to our very own post that covers just that. If there’s anything we hope people take away from National DIY Day, it’s this: The ability to create is part of what makes us human. We all have it in us and anyone can unlock that potential and create anything, if only they set their mind to do it. A squeaky bed can be a real nuisance. When my wife was studying for her PhD qualifying examinations this past winter, she would stay up really late while the baby and I would sleep together much earlier. When she would finally join us at 2 or 3 in the morning, she always woke us up crawling into bed with a loud creak. After weeks of interrupted sleep and having to soothe a disgruntled baby, I finally decided to look into resolving this rather “loud” issue. A little investigation led me to the main culprit: the bed’s boxspring. When I opened up the boxspring, I was surprised by how flimsy it was. It was basically a big cardboard box framed with wood. The smartest option it seemed was to replace the cardboard and reinforce the structure of the box using sturdy, quality plywood and screws. It was a fairly easy and inexpensive project (under $40) that has successfully eliminated all squeaks and creaks (hooray!). You can even do it for cheaper if you go with a thinner plywood board but I wanted something a bit thicker. So if you’re looking to fix a squeaky bed and are not sure about completely replacing the boxspring or trying other suggestions like lubricating the springs, open the boxspring up first and see what you’re dealing with. If the material looks cheap, chances are this fix is the right one for you. 1. Measure the boxspring and head over to Home Depot to purchase and custom cut the plywood for your bed frame size. I had the plywood cut for a queen-sized boxspring: 60 inches wide by 80 inches long (see Figure 1). For me to get an exact size I purchased 2 plywood boards and had them cut so each piece was exactly half (30in x 80in) of my queen bed frame size. 2. Remove your mattress and flip the boxspring frame over to remove the staples and nails from the corners of the cover attached to the frame along with the cardboard until all that remains is the wooden frame (see Figure 2). 3. Investigate the frame to make sure the studs are sturdy. Also, double check to see if the original nails/screws are in good condition. If you find any weak links go ahead and add more screws to tighten the joints. 4. Apply liquid nail liberally along your frame taking care to stay in the center to prevent the glue from oozing out of the sides when you place the plywood boards (see Figure 3). 5. Immediately place the custom cut boards on the freshly glued frame. Do this one board at a time so you don’t make a mistake aligning the plywood to the boxspring frame (see Figure 4). 6. After you have placed the plywood boards on top of the boxspring frame, go ahead and secure the plywood to the frame using wood screws. I left a foot of space between each screw and made sure to drill the screws into the boxspring frame and not into empty space (see Figure 5 & 6). 7. Let the glue dry for at least an hour. 8. Cut the corners of the plywood off at an angle if they extend beyond the frame as it can be a hazard and get in the way of completing step 9. (see Figure 7a & 7b). 9. Using a staple gun, secure the fabric cover over the boxspring (see Figure 8). 10. Catch up on your beauty sleep with squeak and creak-free slumber.